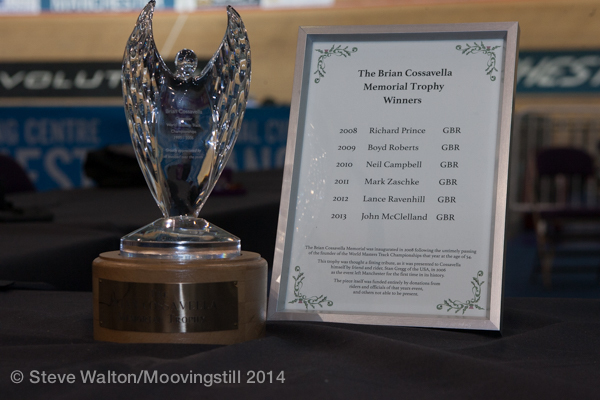 Manchester World Masters Road Championships October 2014 - The prestigious Cossavella Trophy race closes the Manchester Worlds program. Jays Austin won in 2014 & Matt Glanville in 2015. At the World Masters Track Championships in early October BiciSport had six representatives in Jays Austin, Rick McArdle, Matt Glanville, Alex Arancibia, David Willmott and Geoff Baxter. The results were ITT M3 - Matt finished 5th. 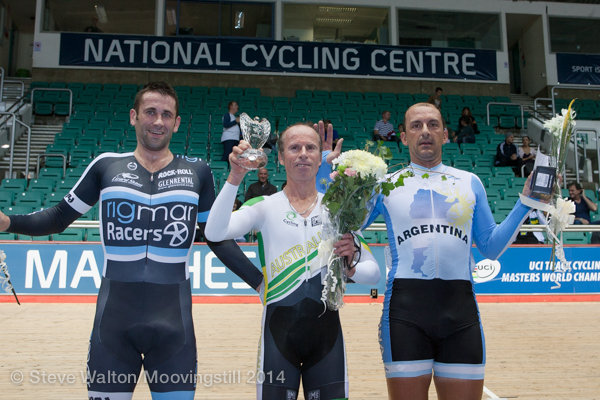 ITTM7 - David Willmott took Gold in the M7 ITT in 35.777secs. Pursuit M2 - Alex qualified 8th in 3-36 (fastest 3-29) Pursuit M3 - Matt qualified 5th in 3-38, Jayson qualified 6th in 3-38, Rick qualified 12th in 3-42 (fastest 3-32). Pursuit M5 - Geoff Baxter qualified 10th in 2-27 (fastest 2-21). Points M2 - Alex Arancibia finished 12th. Points M3 - Jays Austin took the Bronze with Matt Glanville 7th and Rick McArdle 19th (from 23 starters). Points M5 - Geoff Baxter finished 9th from 23 starters. Scratch M2 - Alex Arancibia 8th from 15 starters. Scratch M3 - Jays & Matt on the attack with 8 laps to go & Matt led into the final bend. Matt finished 6th, Jays 11th from 20 starters. Scratch M5 - Geoff Baxter was 18th in the final. Sprint M7 - David Willmott took his second Gold in M7. Team Sprint - David Willmott took the Bronze with Gary Mandy & John Zivanovic. Teams Pursuit - BiciSport (Alex, Matt, Jays, Rick) set the fastest qualifer in 3-21.950 and in the Gold medal ride off came up against a very quick UK team who posted 3-18.338 (Bici posted 3-24.460). Cossavella Memorial - This Memorial race over 16k is the final celebration to the 2014 Championships. Jays Austin took the win (and the 100 pounds first prize) from 23 starters with Alex Arancibia 9th. David Willmott (Masters M7) was nominated for Cycling Australia Cyclist of the Year Award at the end of November (only 4 riders are so nominated). Matt Glanville took 7th in the NSW Elite Track ITT in early November. Geoff Baxter & Kirsty Flanagan qualified for the Clarence Street Cup Wheelrace final and competed strongly. SA & NSW Elite Track Champs in early December. SA Champs - David Zdanowicz (M5 Master based in Adelaide) took Bronze in the SA Elite 1k ITT Championships. NSW Champs - Elite Teams Pursuit - Alex Arancibia, Matt Glanville, Stewart Campbell and Geoff Baxter took on the St George Club for a Bronze medal in a time of 4min 39secs. Elite ITT - Matt Glanville finished 8th in 1min 8secs. Elite Sprint - Nathan McLaughlin qualified 10th in 10.977secs. Elite Points - Jays Austin took Silver, Matt Glanville 4th & Geoff Baxter 5th. Victorian Track Championships in early November - David Zdanowicz (BiciSport Master M5) who resides in Adelaide competed in the revamped Victorian Track Championships and took 3 Gold Medals in Sprint, TT and Individual Pursuit. 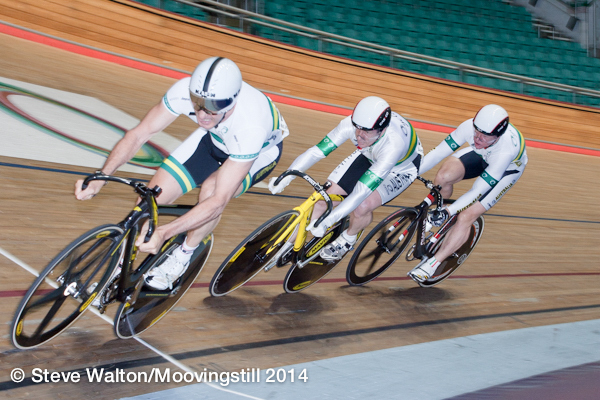 NSW Masters Teams Pursuit on 1 Mar - Bici take 1 Gold 1 Bronze. Bici entered 4 teams and all four teams qualified for the medal round. Women - A good technical ride by Martinette Van Vuuren, Kirstie Dolton & Kristy Flanagan posted a very respectable 2min 44secs. This was good for fourth fastest qualifier and only just behind second and third qualifers (ACT were a stand out). Fourth was the final result. 150+ The team of David Willmott, Geoff Baxter, Peter Selkrig & Mike O`Brien took the Bronze. Mike Lawson, Graham Tierney & Peter Vehoeven took fourth. All Ages - Another fine ride from a classy team of Jays Austin, Matt Glanville, Alex Arancibia & Oliver Dharma Ratne. The fastest time by BiciSport of 3min 26secs in the heat translated to a slick 3-23 in the final for Gold (beating St George by 1.5secs). SA Masters Track on 21-22 Feb - Bici take 2 Gold 1 Silver Dave Zdanowicz posted 2min23secs in the Indiv Pursuit, 36.5secs in the ITT and 11.45secs in the Sprint qualiying round for 2 Gold & 1 Silver. BiciSport results are Individual TT - M3 - Matt Glanville took the Bronze. M5 - David Zdanowicz took the Bronze & Geoff Baxter 6th. M7 - David Willmott took Gold Team Sprint David Willmott, Nathan McLaughlin & Matt Glanville took Silver with Geoff Baxter, David Zdanowicz & Rod Chaplin 7th. Individual Pursuit M2 - Oliver Dharma Ratne took Bronze M3 - Matt Glanville took Silver Jays Austin the Bronze M5 - David Zdanowicz took a great Gold in an Australian record of 3min 20secs. Geoff Baxter rode well. M6 - Peter Verhoeven took the Bronze in a `come from behind" epic. M7 - Mike Lawson was richly rewarded with a solid Bronze. Sprint M3 - Nathan McLaughlin was off song with a Bronze M5 - David Zdanowicz too Silver M7 - David Willmott took Gold W4 - Kirstie Dolton took 5th Scratch - M2 - Alex Arancibia took Silver with Oliver in support. M3 - Matt Glanville took Gold with Jays in support M5 - Geoff Baxter took Silver W3 - Kirstie Dolton took Bronze with Martinette 5th Teams Pursuit - Women - Martinette Van Vuuren took Gold. All Ages of Jays, Alex, Matt & Oliver 150 + - David, David, Geoff and Mike O` Brien took Silver and James Thornton, Graham, Mike & Peter took 5th.